The new production of Monteverdi's L'Orfeo at the Roundhouse (13 January 2015) is an intriguing new collaboration between the Royal Opera House and the Roundhouse. It was directed by Michael Boyd, former director of the Royal Shakespeare Company, who was making his operatic debut. Working with his regular collaborator, designer Tom Piper, Boyd's stylish production made full use of the dramatic space provided by the Roundhouse. Gyula Orendt sang Orfeo, with Mary Bevan as Euridice and La Musica, Susan Bickley as Silvia/Messagiera, Anthony Gregory, Alexander Sprague and Christopher Lowrey as pastores (here called pastors), James Platt as Charon, Rachel Kelly as Proserpina, Callum Thorpe as Plutone and Susanna Hurrell as a Nymph. They were joined by a vocal ensemble of students from the Guildhall School of Music and Drama, with young dancers from East London Dance. Christopher Moulds conducted the Orchestra of Early Opera Company. 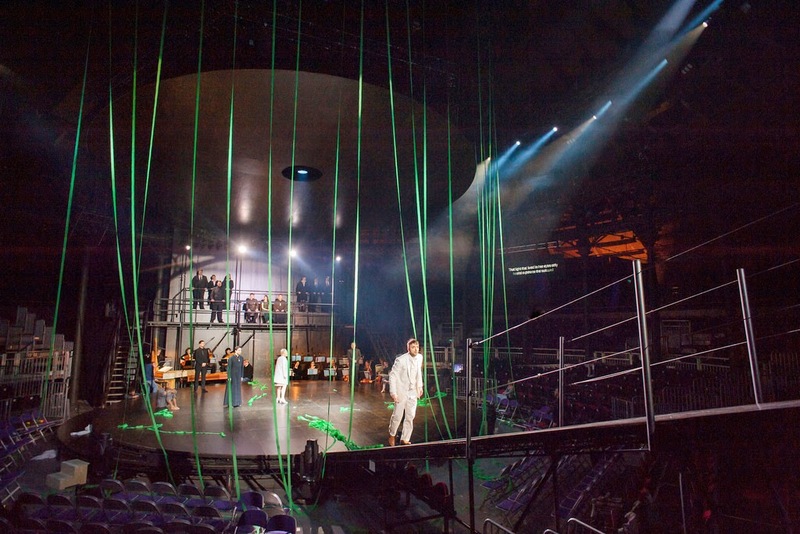 Lighting design was by Jean Kalman, sound design was by Sound Intermedia; Liz Ranken was the movement director and Lina Johansson the circus director. The opera was sung in a Don Paterson's new translation. Boyd and Piper's production, though modern in style, responded to the hierarchical nature of the society and court of the Gonzaga Dukes of Mantua for whom Monteverdi wrote the opera. 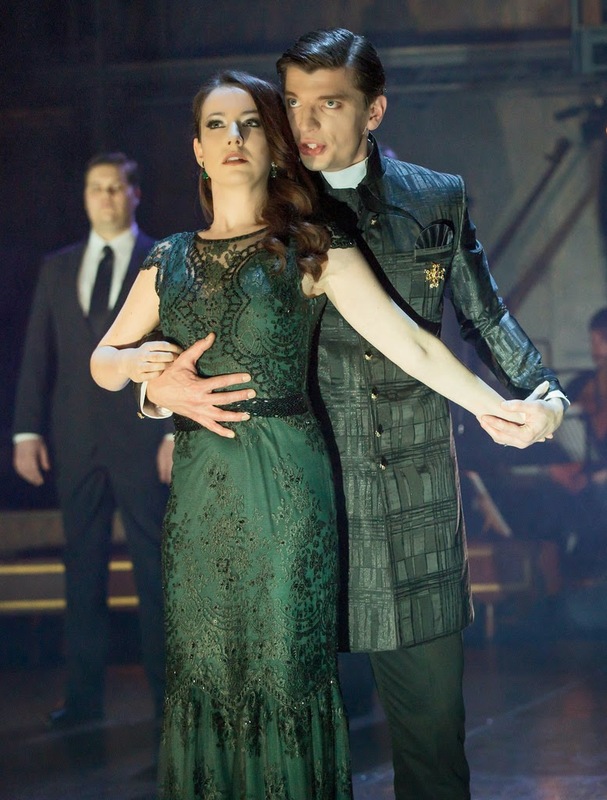 Though the costumes were contemporary, so that Plutone (Callum Thorpe) and Proserpina (Rachel Kelly) were accompanied by a squad of be-suited heavies (no dark glasses, thank goodness). there was a sense of ceremonial and ritual which reminded me of Jean-Pierre Ponelle's production for Zurich Opera (which I saw at the Edinburgh Festival in the 1970's). The circular playing area was bare, with the orchestra placed behind. Then behind them was a blank wall (also helpful for sound reflection) with just a single door, above platforms on which sat or stood Plutone, Proserpina, pastores and entourage (the vocal ensemble) to watch the spectacle. There was also a very long ramp which led dramatically down from upper circle level to the stage. The court made its dramatic entry down this (positively perilous in high heels) to the accompaniment of Monteverdi's opening toccata. 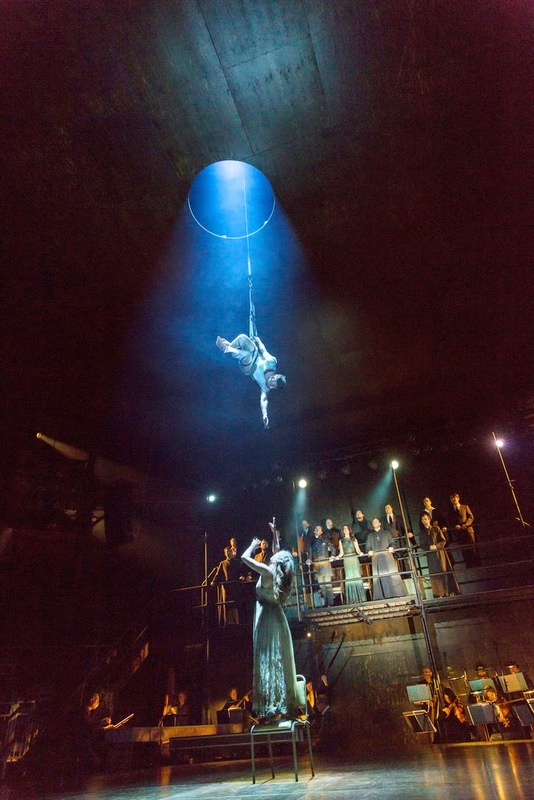 The players (the dancers and singers who would perform the opening prologue) were dressed in boiler suits and hand cuffed, and made their entrance through the rear door. Here, we come to the only significant change that Boyd made to the opera. The setting was no longer pastoral so the pastores (shepherds) became pastors with Anthony Gregory, Alexander Sprague and Christopher Lowrey being dressed as priests (with stoles). Sprague doubled as Apollo so the final duet became more a religious injunction than fatherly support. This changing of the religious background to the piece rather worried me, avoiding explicit references to the Greek Gods is one thing but replacing them with Christian priests seemed unsatisfactory. Other aspects of the iconography were puzzling too. During the opening scene with La Musica (Bevan), the body of Orfeo was brought on and draped over Bevan, pieta-like. This was repeated at the end of the opera as a prone Bevan was draped over Orendt, both scenes echoing Christian iconography. As the singers commenced the prologue, their chains were removed and at the end of the prologue the principals cast off their boiler suits and dressed according to their roles. What was going on? I have to confess that at first I had a lingering sense of doubt; who were these people and what were they doing? But the sheer theatricality of Boyd's production convinced me, the way it combined full use of the space with detailed direction. For a first time opera director Boyd's achievement was impressive. He seems to have coped with singers well with his handling of the delivery of the sing text neither overtly fussy nor awkward. He had inspired in his singers a vivid theatricality which chime well with Monteverdi's opera and made for a stirring performance. Hungarian baritone Gyula Orendt made a thrilling Orfeo, seemingly not at all inhibited by singing in English (which was, though accented, wonderfully clear and communicative). He has quite a full dark voice which gave the role a vivid depth to it, but Orendt as equally thrilling in the more elaborate passages. Possente spirto (which was sung as Orendt descended the long ramp towards the implacable Charon of James Platt), seemed to be sung in Monteverdi's ornamented version with Orendt using the ornaments in a vital way which heightened expressiveness rather than just being showy. The results were mesmerising. At the end, Orendt's duet with Sprague was equally fine, made more so as Orendt was placed prone in a sling suspended over the stage. In fact the opera closed with Orendt suspended in the sling, straining and failing to reach Euridice below him. A powerful image to match the music. Mary Bevan was a beautifully expressive La Musica, creating a real sense of the recitar cantando which combined Paterson's poetic translation and Monteverdi's music with powerful fluidity and naturalness. Susan Bickley was stunning as Messagiera, delivering her monologue with a strong emotional undertow whilst walking down the long ramp. Another wonderful example of how words, music and drama combined to make something simply riveting..
Callum Thorpe made a strong, dark-voiced Plutone, presiding with hauteur over the proceedings and supported by Rachel Kelly as an elegant Proserpina who pleaded beautifully. James Platt made a not inconsiderable Charon, supported by two heavies from the vocal ensemble. Anthony Gregory, Alexander Sprague and Christopher Lowrey made fine pastors, each highly involved in the action and showing keen regard for Monteverdi's line and text. The vocal ensemble of Guildhall School of Music and Drama students (Raphaela Papadakis, Jennifer Witton, Jessica Dandy, Bethan Langford, Meili Li, Thomas Atkins, John Findon, David Ireland, Johannes Kammler) made a lovely lithe and vibrant sound in the ensembles helping to give the music a madrigalian feel despite the venue's size. It probably helped that they were essentially stationary, with the movement taking place below them with the dancers. The dancers from East London Dance were all school children; East London Dance is a project that the Royal Opera House's Learning and Participation Ballet team works with. The 14 young people's stamina and expertise was impressive. The choreography was quite athletic and often they were used illustratively, to create an arch as the entrance to Hades or rolling on the floor as the river Styx. Mostly the results were sympathetic, but once or twice there seemed to be a bit too much movement which distracted from the music and drama, moments when the dance became far too attention-seeking. The sound design was impressive; from where we sat in the circle the sound felt natural and directional with no sense of the artificiality which can occur. I liked Don Paterson's translation, which was understandable, direct and modern whilst still managing to remain poetic and fitted the music beautifully. It was well delivered by all concerned. In fact, despite the whole ensemble was impressive particularly the way the singers seemed to be listening and looking at each other, thus creating a sense of ensemble despite the large distances. This was very much thanks to conductor Christopher Moulds (who also played keyboards) who did a sterling job as traffic policeman besides drawing a strong performance out of the performers. There was some thrilling moments from the Orchestra of Early Opera Company, notably the opening toccata and the music for Hades, but also some subtle ones and some of Monteverdi's lovely effects such as the harp and cornett accompaniment of Possente spirto were simply magical. The whole seemed to transcend the size of the venue, despite having a continuo group which included two keyboards (harpsichord/organ/regal), four lutes/theorbos and a harp. As a venue, the Roundhouse does not yet quite seem to have 'got' opera. Before and after the performance there was thudding music from the bar which hardly seemed condusive to extending the atmosphere of Monteverdi's opera. The logistics of getting everyone out of the theatre seemed to be worryingly congested, and many people seemed to give up on the bars at the interval and pop over to the Sainsbury's across the road.